They say people in glass houses shouldn't throw stones, but if that house is a rocks glass, and the stones are ice cubes, we say go right ahead. This cocktail is an ode to summer. Fresh cucumber and aromatic basil pair delightfully with the clean brightness of lemon and botanically complex gin. This drink is crisp, sophisticated, and the closest thing we can find to internal AIR-CONDITIONING. In a shaker, add the first four ingredients and gently muddle. Add ice to the shaker. 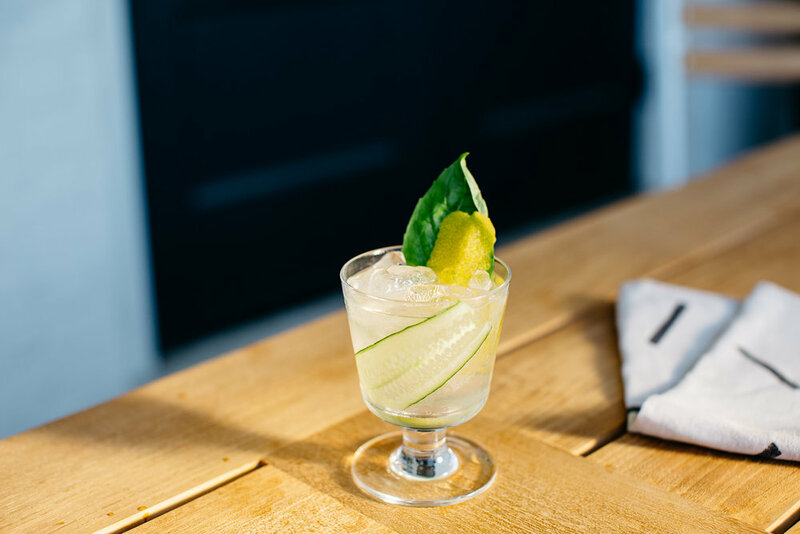 Shake, and strain into a rocks glass & top with Honey Basil soda. Garnish with fresh cucumber, lemon twist, fresh basil, or anything delicious you've got growing in the garden.